"This is the classic Italian almond macaroon. When first baked they are crispy on the outside and chewy on the inside. As they sit, they get crunchy throughout. Delicious with any fruit dessert." Using a teaspoon, place well rounded spoonfuls of dough onto prepared baking sheets. Cookies should be at least 1 1/2 inches apart. Bake in preheated oven for 20 to 30 minutes. Cookies should be golden. Allow cookies to cool completely on the paper before removing. Store in a dry place. Really good!I used Splenda in these and baked them on a stoneware cookie sheet and they turned out great! A cookie I love with no butter,flour or sugar.Who would have thought??????? I absolutely loved these! 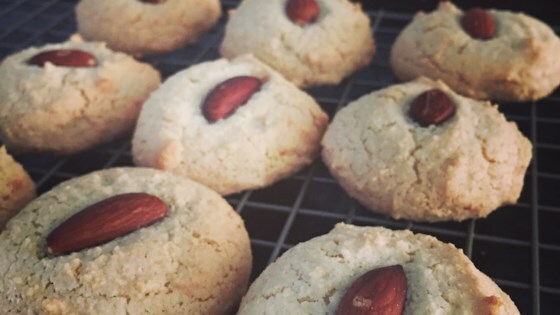 I made them for my inlaws for passover and the whole family said they were "ridiculously good"! The only change I made was to add 1/2 tsp. vanilla. I also added 1/2t vanilla. It is best to chill dough prior to baking...cookies come out like picture. My Italian family adored these..so did my Cookie Exchange club!